The Long-Armed Cross Stitch, sometimes referred to as an elongated cross stitch, can be used in bands and rows, or to frame a section of a design in counted thread embroidery projects. The stitch is worked nearly identically to a standard cross stitch, with each stitch made from a group of two separate diagonal stitches. What makes this different is that the second leg of the stitch is elongated. When worked in rows, the stitches cross each other and resemble a braid. If you work this on evenweave fabric, it's easy to count the threads and keep your stitching straight and the spacing even. When working this stitch on surface embroidery projects, consider pre-marking the fabric with two horizontal lines and evenly spaced marks. Bring your needle up at point 1, and then down at point 2, forming a diagonal stitch worked from the top left to the lower right. Bring the needle up through the fabric again at point 3. This is on the lower line and should be directly beneath point 1. Go back down into the fabric at point 4, forming a longer diagonal stitch that is worked from the lower left to the upper right. 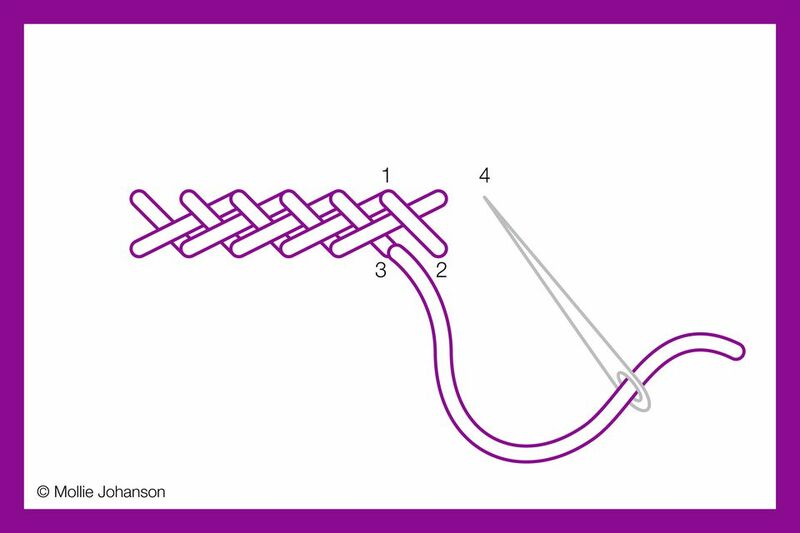 This stitch should be worked twice the distance of the first stitch. The next stitch then starts at the halfway point between the first and second lengths of the previous stitch. Continue stitching along the lines, always working the diagonal stitches in the same order so it creates a consistent row of stitching. Long-armed cross stitch works on both straight and curved lines, and makes an excellent border on its own or combined with other stitches. The texture of this stitch makes it suitable for stitching anything you want to look braided, as well as things like tiny fences. Working a row of long-armed cross stitch that is about 1/4in tall and using all six strands of embroidery floss creates a more dense stitch. If you were to work close rows of this it would make a good textured fill. But you might also work with fewer strands or with larger stitches, resulting in a more open interlocking of cross stitches. If you are working on a curve, bear in mind that the length of each stitch may need to adjust to fit the curves. This is where pre-marking the stitches helps. You should have the same number of markings on each of the lines. For a different look, try stitching this with two colors. Thread two needles, each with a different color of thread. Work the short diagonal stitch with one color and the longer diagonal stitch with the second color, changing back and forth as you go. Another way to change this up would be to reverse the order that you stitch the two parts of each stitch. Instead of starting with the shorter stitch, start with the longer one. This small adjustment will be subtle, but noticeable.